Enter into a world of chic femininity with the Salvatore Ferragamo Signorina Eau de Parfum, a pretty fragrance with a hint of audacity. 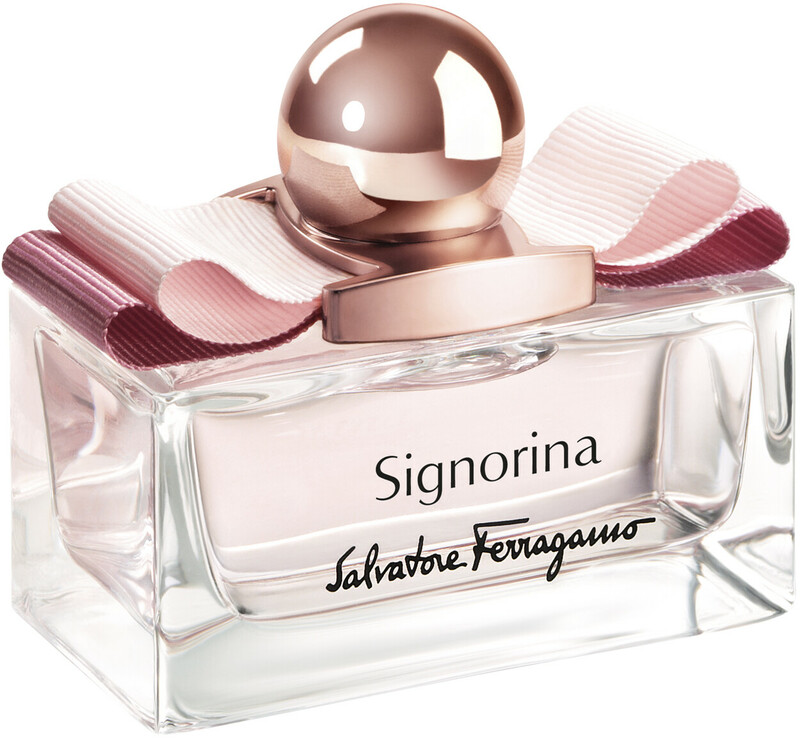 Signorina captures the elegance and charm of Italian style in a cascade of floriental and fruity notes. Unexpected gourmand touches lend a lighthearted airiness, while bright fizzy notes reveal a joyful quality. The Signorina woman is timeless, modern and creative, with a subtly cheeky character. Her zest for life and graceful sensuality are mirrored in her beautiful fragrance, a blend of currants, pink pepper, jasmine and pannacotta. Inspired by the iconic Vara bow, Salvatore Ferragamo Signorina is presented in a weighty cut glass bottle topped with a pink gross grain bow. 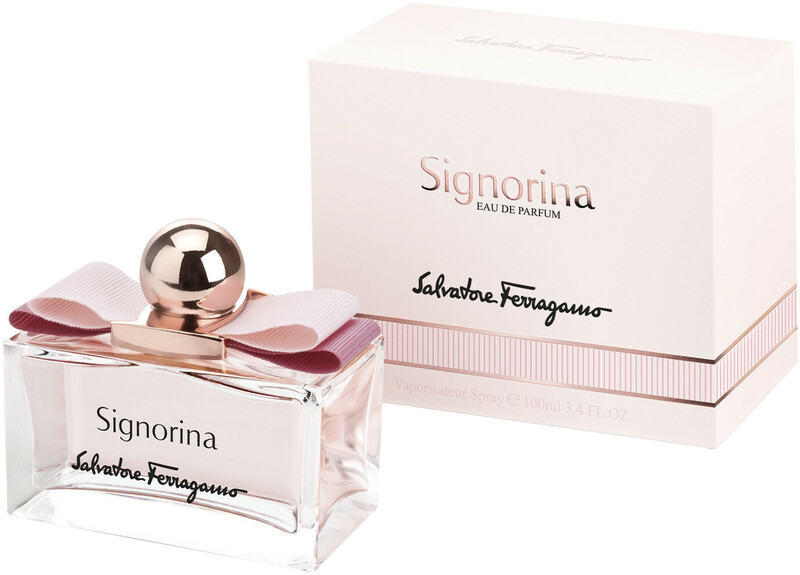 Understated, high fashion, and so Ferragamo, Signorina is a perfume to adore. Salvatore Ferragamo Signorina Eau de Parfum Spray is rated 4.7 out of 5 by 3. Rated 4 out of 5 by Bessarabia from Gorgeously Femine! Beautiful bottle decorated with pink ribbon looks great on my dressing table! The scent is heavenly....very femine and rather alluring. Just wish it lasted a little longer. Rated 5 out of 5 by Rainbow from Angels Kiss Salvatore Ferragamo Signorina Eau de Parfum Smells So Beautiful! Normally I tend to avoid florals, especially rose as it tends to turn sour on me. But Not... Salvatore Ferragamo Signorina. Signorina EDP is the perfect floral for people that normally hate florals. Sweet ~ Beautiful ~ Soft .. Like an angles Kiss! Perfect for Winter or Summer - Perfect for Day or Night. Rated 5 out of 5 by missgiggles from My New Favourite Scent I had been looking for a warmer scent for winter and after lurking beauty halls smelling vanilla, musk and woody based scents, I almost gave up. Then I stumbled upon Signorina. I had seen magazine adverts for this but hadn't heard much about it. I tried it a couple of times and it starts of sparkly but settles to a warm, creamy sweetness which is hard to describe. After getting some colleagues to give me their opinions, I decided to buy it and I have only fallen for it more since I have been wearing it. It's not in your face so if you're looking for that, you may be disappointed but it's one of those that makes you go 'mmm' when you catch a whiff (must be the pannacotta). It's subtly warm without being spicy so it's actually a good choice all year round and not just for winter. I really like the bottle as well, girly, sweet yet sophisticated (just how I'd describe the scent!). There is also the Signorina eau de toilette (purple bow) but that one is too green for me and gave me a headache so I am going to stick to this one (eau de parfum) - my new favourite by far!